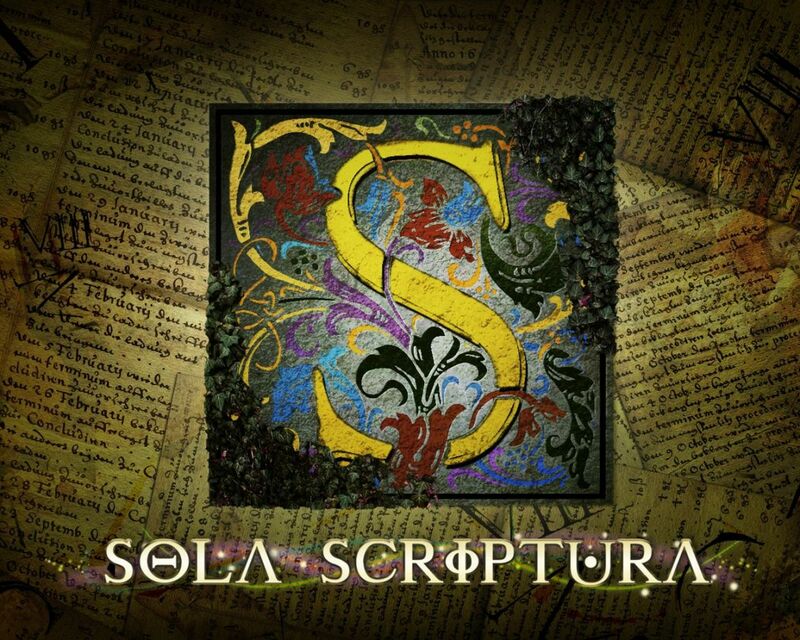 Sola scriptura (literally translates "by scripture alone") is the doctrine that the bible is the only infallible and inerrant authority of Christian faith, and that it contains all knowledge necessary for salvation and holiness. To be clear on this, the doctrine of sola scriptura does not contend that no tradition, creed, etc. may be used to communicate or teach truth, only that all traditions, creeds, etc. must be subservient to and corroborated by scripture. All other means of communicating truths are fallible, meaning they can contain errors. Only scripture is infallible and cannot contain errors. The question, then, is does the bible teach that it is infallible and does it teach that any device other than itself is fallible or infallible. There are two ways doctrines and knowledge are communicated through scripture, explicitly and implicitly. Explicit teachings are ones that the texts actually state. For example, the teaching that Jesus died on the cross is explicitly taught in scripture. There are bible verses that state, very plainly, that Jesus did in fact die for our sins. 1 Corinthians 15:3 is one such scripture. Other teachings and doctrines are taught implicitly, that is they do not have verses stating their truth but they are present throughout scripture none the less. The doctrine of the Trinity is one of the most commonly held implicit doctrines of the church. No one verse states that the Godhead is formed of the Father, Son, and Spirit but the whole of scripture testifies that that is indeed the case. I believe that sola scriptura is a combination of both explicit and implicit teachings in the bible. I will examine both ways of discovering this doctrine in scripture. The most explicit teaching of the doctrine of sola scriptura is found in 2 Timothy 3:16. There is some debate as to whether the Greek word pas that is translated "all" here should be instead translated "every" but it does not change the meaning of the verse either way. Either the whole of scripture is breathed out by God or every individual or passage of scripture is breathed out by God. Either way, the end result is that all of scripture is God breathed. The next issue is what exactly Paul is referring to when he says "scripture". Certainly he does not mean the exact bible we have today because it did not exist in its entirety at the time of this writing. Certainly he was including what we would call the Old Testament in his definition of "scripture". The question is does Paul intend to mean only the Old Testament. I don't believe so. In verse 15 Paul specifically references the Old Testament writings to Timothy. Paul did this for the simple reason that he wishes to draw a distinction between the Old Testament (2 Timothy 3:15) and WHATEVER has a right to be called divinely inspired Scripture (2 Timothy 3:16). The latter comprises more than the former. The earnest conviction of this writer supports Hendriksen's comment on this, and no objections to it have any weight against it. Scholars agree that this verse applies to the Old Testament, but the error comes when some of them also refer 2 Tim. 3:16 to the Old Testament, on the premise that the New Testament at the time of Paul's writing had not been written. Nevertheless, a great deal of the New Testament had indeed already been written. In fact every book of the New Testament preceding 2 Timothy, of which there are no less than fifteen, had already been in circulation for a period of time covering up to three decades! Indeed some of the New Testament was to come subsequently to the publication of 2 Timothy, but as regards the central message of the New Testament, it had already been published for decades; besides that, Paul left room here for whatever writings in the future might qualify as Scripture. Also, the notion that Paul did not consider his own writings as Scripture is also false. Time and again in his epistles, he used the ancient formula of the prophets of God, "thus saith the Lord," or "He saith," as in Ephesians 4:8; 5:14; 1 Thessalonians 4:15, etc. Therefore, 2 Tim. 3:15 refers to the Old Testament, and 2 Tim. 3:16 refers to the New Testament, in addition to and inclusive of the Old Testament, thus, to both the Old Testament and the New Testament. Peter also shows us that the letters of the Apostles were being accorded "God-breathed" status in 2 Peter 3:15-16. Peter also uses the Greek word graphe for "Scriptures" as Paul did in his letter to Timothy. The term "God-breathed" is translated from the Greek theopneustos. That word is used no other place in all of scripture. It only is used in reference to itself. Peter elaborates some as to what that looks like in practice. So all scripture, both what we consider to be Old and New Testaments were written by men under the direct inspiration of the Holy Spirit who enabled them to remember perfectly the things of which they wrote so that we might receive them precisely as God intended that we would. As an aside, if the scriptures we read and learn from are not perfectly accurate in every way, then nothing we think we know about God, salvation, eternity, etc. can be believed with any level of legitimate hope. The inspiration of the scriptures is the foundation upon which every other doctrine rests. This is the explicit teaching of the bible as to its own infallibility. In my next post I will look at the ways the bible teaches the doctrine of sola scriptura implicitly.